Golf carts are a great investment for riding on and off the course. You can finally stop renting and take full control of your golfing experience. With that being said, a cart is only as good as its battery. Golf carts run off of numerous batteries that are capable of going through deeper discharge and charging cycles. While they may look similar to car batteries at first glance, they’re typically a bit smaller and require a lot of care. To make the most out of your golf cart, you need to invest in the very best batteries on the market. Golf cart batteries are much more complex than most people assume. Many first-time golf cart owners are quick to realize that there’s a unique learning curve in the selection and maintenance of their batteries. Luckily, there are a number of great batteries on the market to help you on your way. Here’s a collection of some of the best 6-volt golf cart batteries available. 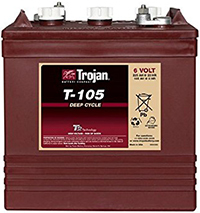 This model from Trojan is a flooded lead acid battery. It measures roughly 10 inches wide by 7 inches wide and only 10 inches high. It has an impressive 225 AH at a 20-hour rate. It’s a premium battery that’s reliable and tough. Trojan has their own unique paste formula and fiberglass separator design. They’ve carefully crafted this battery to maximize performance as much as possible. It’s capable of going through up to 750 cycles. If you’re looking for performance and versatility, consider this deep cycle battery from Universal Battery Group. It can be mounted in any position because it’s completely sealed and spill-proof. It’s an AGM battery that utilizes the strength and absorption of fiberglass. It’s also very resistant to continuous vibrations and impacts. It has a 200 AH capacity rating. 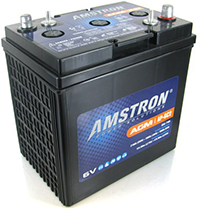 Another great AGM battery, the GC2 from Amstrong is a durable powerhouse. It has a 210 AH capacity at a 20-hour rate. The entire unit is sealed and ready to go. You can ride confidently knowing that the battery’s contents will stay put through rough rides and bumps. It has a small footprint of roughly 10 inches long by 7 inches wide. 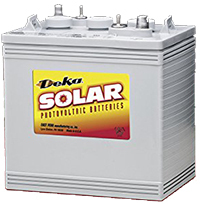 This gel battery from Deka Solar is a great option for your golf cart. It performs well through hundreds of deep cycles to provide you with robust power when you need it. The electrolyte stays put even through the bumpiest ride. It’s also completely sealed and maintenance-free. The measured 20-hour capacity is 180 AH. 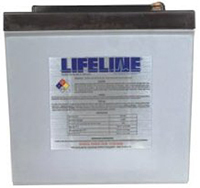 The deep cycle battery from Lifeline Batteries is built to last. In fact, it’s built to military standards and is capable of going through 1000 cycles at 50% depth of charge. It’s an AGM battery, so you won’t have to worry about serious damage or leaks. It can provide you with plenty of power whenever you’re ready to ride thanks to the 220 AH capacity at a 20-hour rate. 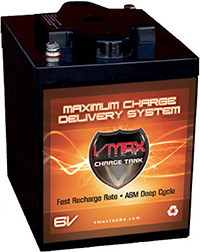 This VMAX battery is designed to provide you with plenty of power with very little maintenance. It’s an AGM battery that completely absorbs and contains the electrolyte. There’s no need to add water to the tank or even check the gravity reading. It’s a truly maintenance-free option that’s capable of lasting up to 10 years. It has a capacity rating of 225 AH. If you need a slightly higher voltage, consider this 8-volt battery. It utilizes AGM technology to provide you with high performance and longevity. It’s valve-regulated and built to stay safe in virtually any position. The 200 AH battery can go through hundreds of cycles without any issue and continue to provide you with reliable power for years to come. Golf cart batteries come in a range of different voltage sizes. 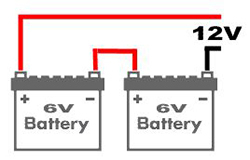 A battery’s voltage refers to the force used to create an electrical current. Basically, it’s the strength of a battery. 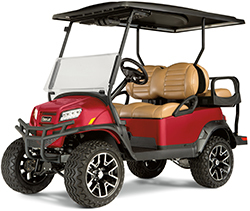 Manufacturers typically offer batteries for golf carts in 6-volt, 8-volt, and 12-volt sizes. 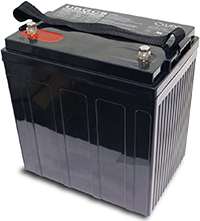 Many cart owners utilize 6-volt batteries because of the versatility offered by a lower voltage. They can be connected in a series to achieve the desired voltage. Unlike cars that utilize a single battery, golf carts need many batteries to run. They’re entirely electric. Carts need a constant supply of energy to start and propel you forward. The exact number you’ll need will depend entirely on the voltage requirements of your cart. This can vary from manufacturer to manufacturer based on the size and weight of the cart. Typically, you’ll find golf carts have a voltage requirement of 36 or 48 volts. Each battery you use will contribute to that final voltage number. For example, if you have a 48-volt golf cart, you’ll need eight batteries. Eight 6-volt batteries combine to create a total charge of 48-volts. To make these batteries achieve that voltage requirement together, they need to be connected in a series. With a series connection, the voltage from one battery will flow to the next. This connection continues from one battery’s negative connection to the next battery’s positive connection until all the units are united as one. There should only be one connector wire going from one battery to the next. After they’re all connected in a line, the positive connection of the first battery and the negative connection of the last battery are attached to the golf cart. Essentially, the series of batteries act as one unit. All of the separate voltages are unified to provide the power your golf will need to run. While they may look similar, not all batteries are made the same. Subtle differences in their build can make a huge difference in how they perform. There are a number of things to consider when you’re looking for the right batteries. Batteries come in varying capacities. The capacity refers to how much power the battery can hold and supply. A lower capacity means that your golf cart will have less time to run. Battery capacity is measured in AH, also known as amp hours. It’s always best to get high-capacity batteries so that you can run the cart longer before you need a recharge. You can always combine batteries to increase capacity. To do this, you’ll need to create a parallel connection. With this type of connection, you would connect both positive and negative terminals of one battery to the next. The type of battery you’ll need will depend on a number of factors. There are three basic types of golf cart batteries available. While they each perform well, they have certain characteristics that may be beneficial to your unique needs. Flooded lead acid batteries are the most common type of battery you’ll find on the market. They’re versatile in terms of design and use. They come in a number of sizes and aren’t sealed. This means that you can replenish any lost electrolyte. These batteries have lead plates based on sulphuric acid. 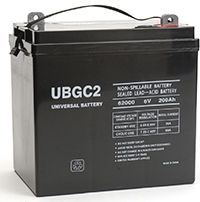 Gel lead acid batteries utilize a thickening agent to keep the electrolyte still. It can’t move freely. This is great if you ride rough. If your battery gets cracked, it’ll still run smoothly. The one downside is that it’s completely sealed. AGM lead acid batteries are relatively new. These batteries use a fiberglass separator to keep the electrolyte in place. AGM batteries are considered to be one of the most robust battery options because they’re spill-proof, resistant to vibrations, and hold up well to impacts. Take a look at the battery’s build to ensure that it matches your riding style. While golf cart speeds are limited, your batteries can experience damage as you go over rough terrain. Go for batteries with rugged sides that are resistant to cracks. Also, consider investing in batteries that have electrical short protections. This will keep many components safe from harm. Batteries don’t have an infinite shelf life. They’ll give out after a certain number of cycles. A cycle refers to the charging and discharging of electricity. Each time you run your battery empty and recharge it, your battery’s life is diminishing. Most batteries are capable of going through 700 to 1,500 cycles. Go for batteries that have more advanced cycling technology and a guarantee of longevity. Golf cart batteries need to be able to go through deep cycles. These batteries have high capacities and most owners utilize it as much as possible. This results in longer charging and discharging cycles. This puts a strain on the battery. Luckily, high-density lead plates and extra reinforcements can support deeper cycles and continuous recharging. Testing your batteries on a regular basis is a key part of maintenance. A time will come when you’re battery stops working. 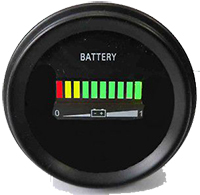 You can gauge the health and life of your battery early with a few simple steps. Doing this will give you ample time to get a new battery before it affects your existing array and keeps you off the course. The first step is to disconnect the battery and perform a thorough inspection. Look for signs of damage like cracks and fluid leaks. Pay close attention to the terminals and look out for ashy deposits. If there are any, clean them off with baking soda and water. Then, read the manufacturer code. It’s often located on a sticker on the side or near a terminal. The code will display a letter and a two-digit number. Letters range from “A” to “L.” They represent the month the battery was manufactured. The number represents the day. If your battery is older than 6 months, it’s likely deteriorated in quality and performance. For an accurate measurement, let it charge fully. Once it’s reached its maximum capacity, let it sit for up to 12 hours. This will get rid of any surface charge on the battery. Surface charge can affect the readings on your equipment. Then, use a hydrometer and voltmeter to check the battery. To use the hydrometer, remove the cell cap and dip the end of the device into the first cell. Simply squeeze the bulb at the end of the hydrometer and release it to collect some fluid. Compare the gravity reading with the manufacturer’s accepted range. Repeat this with each cell until you find a damaged cell. Use the voltmeter to check the voltage of the battery and match it up with the advertised measurement. Your golf cart is a big investment, so you should protect it by utilizing high-quality batteries that last. Advancements in battery technology are shaping the way golf cart owners use and maintain their ride. By choosing the right battery, you can make the most out of your cart and ensure that it’s always ready for the golf course. The fillers should be taken off while charging and the operation is better with a draft of air like near being outside. Also there is no info on the time of charging before considered OK. Poor cells often gas very early in the charging whilst good ones do not. Avoid any flames while charging. Keep metal tools clear of battery terminals or if using take extreme care.